Pat is really a true force of nature. We had never met properly so I was really looking forward to filming with her. The day of a concert on tour is always somewhat stressful for musicians – new hall, rehearsals etc so I was very grateful that Pat made time for the interview. And what a great place for an interview in Bonn it was – on the banks of the Rhine river! I was also very happy to discover the Camerata Bern. Their ensemble playing is fantastic and they supported Pat in her solo pieces the whole time. The Karl Amadeus Hartmann Concerto Funebre for violin and string ensemble was incredibly moving – I had always thought that it wasn’t my cup of tea but hearing Pat explain the piece in the interview and then experiencing her interpretation of it in the concert, my mind was changed completely. I had such fun with Pat – I wish the episode could have been an hour as she said so many wonderful things. 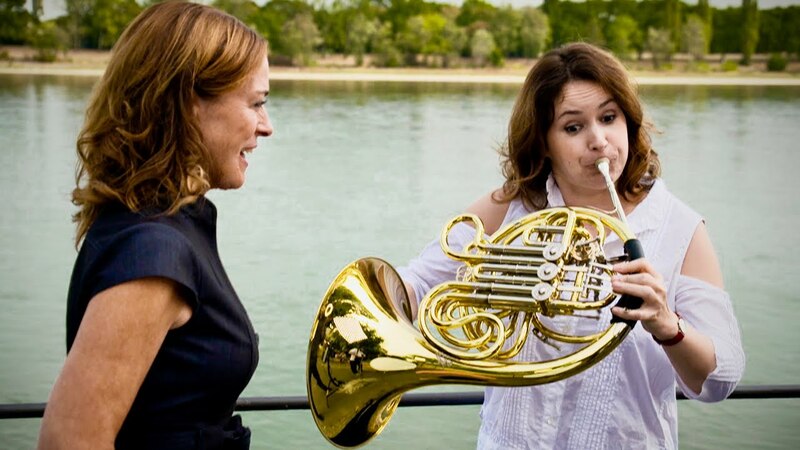 Don’t miss the extra video where we discuss the horn parts in the Beethoven violin concerto… I think we’ll make a horn player out of her yet!